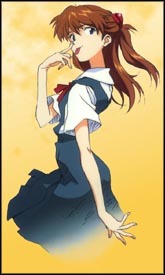 Soryu Asuka Langley was born in the year 2001 AD. She's one quarter Japanese and three quarters German. She is referred to as "Second Children" (the one who was second to pilot the Evas.) Asuka's personality is somewhat vain. Asuka is a extremely competitive and tries to be the best at everything. Sometimes it gets her in a mess were the others have to get her out of it. She won't accept losing at anything. She is very popular in school.